In a practice spanning nearly two decades, Jose Dávila (born 1974, Guadalajara, Mexico) has critically and playfully explored the visual tropes and iconic symbols of modern art, architecture and urban design. Trained as an architect and self-trained as a visual artist, Dávila creates elegant, refined sculptures, installations and photographic works that simultaneously emulate, critique and pay homage to 20th century avant-garde art and architecture. 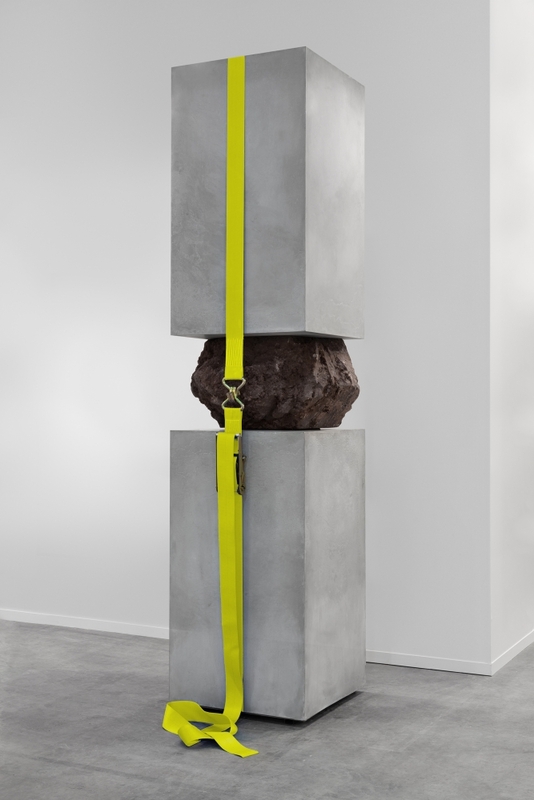 In recent years Davila has developed a series of sculptures whose structures are based on the arrangement and overlapping of material such as boulders, glass and marble, kept in perfect balance with industrial ratchet straps. The articulation of these elements displays the resistance between opposing forces, a characteristic present throughout all his sculptural work. The works in this series, titled Joint Effort, are often described as “totems,” ancient ceremonial objects that accumulated symbolic content in a vertical manner, marking early civilizations’ efforts to materialize a tangible link between Earth and Heaven. Here Dávila operates in a similarly symbolic manner. Joint Effort merges natural stone, one of the most basic and primitive construction elements, with concrete volumes—a highly malleable modern material that can conform to any kind of shape—to achieve a functional articulation of a constructive hybrid. For Dávila, this contrast condenses the essence of construction and its constant transformation throughout history. Displayed at Rockefeller Center among the urban architecture of New York City, these associations become even more relevant as Joint Effort resonates with the verticality of the city’s skyline.